If you own an old house, there’s a pretty good chance your windows, which probably don’t work/are painted shut, have little pulleys at the top of the window frames. Have you ever seen them working on windows that are either restored or somehow survived all this time without a single lazy painter cutting the ropes and painting the sashes shut? They’re really cool when they’re working. It truly is a shame that so many of them are non-functioning. 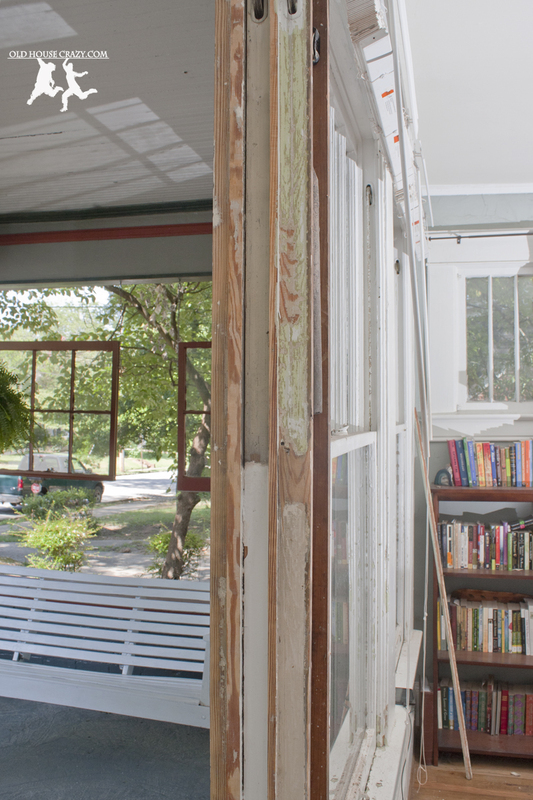 When Christy convinced me three years ago that we should paint the house, we also decided that we would try to restore some of our cool old windows. 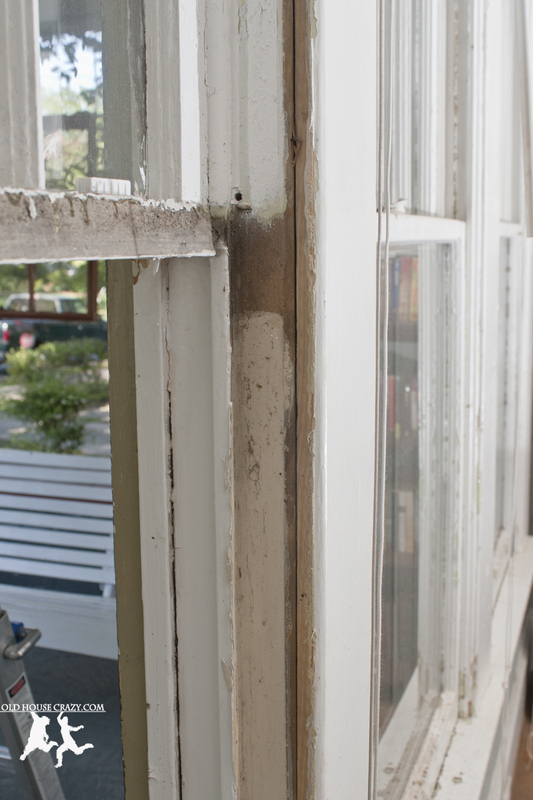 In this post, I’m going to discuss how I took apart our old windows and began the restoration process. If you own a home, you’ll probably break a window at some point. Charlie broke our first. 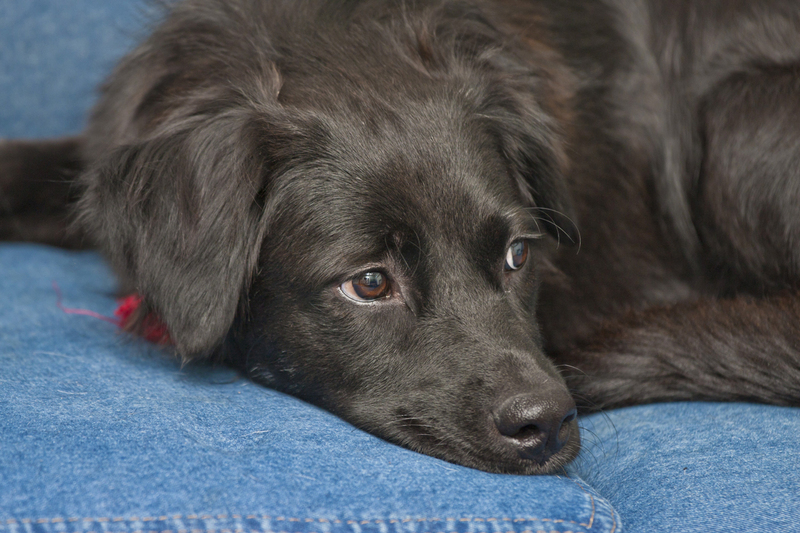 This is actually one of my favorite topics and there is some back story: Two years ago, before we started scraping and painting, and before I considered myself a DIYer, our dog Charlie, who looks so sweet in the photo above, shattered one of our front windows while we were at work. I think she was barking at a cat and tried to go through the window to get at the feline pest. By the time I got home, it was too late to call a pro (who would you call to fix a window? ), so I decided I’d try to figure it out and went to Lowe’s. I got more practice. 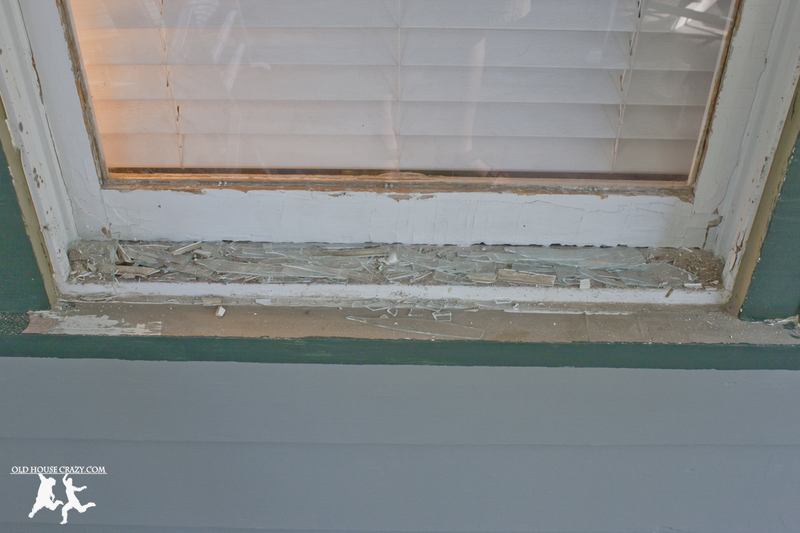 In the next few months, our dogs broke through the other two windows in the front of our house as well. Furniture changes were made so that they no longer have access to that bank of windows. We haven’t had this problem since. 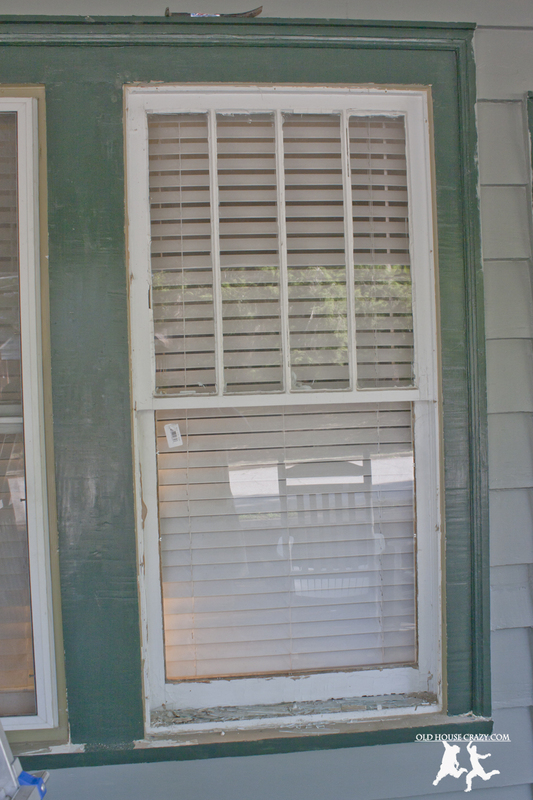 You can see in the photo above that, by the time I replaced the last window, I was so perturbed that I didn’t even clean up all of the broken glass between the window sash and the storm shutter. It’s been there for the last two years, until today when I removed the storm shutter and finally cleaned it up. 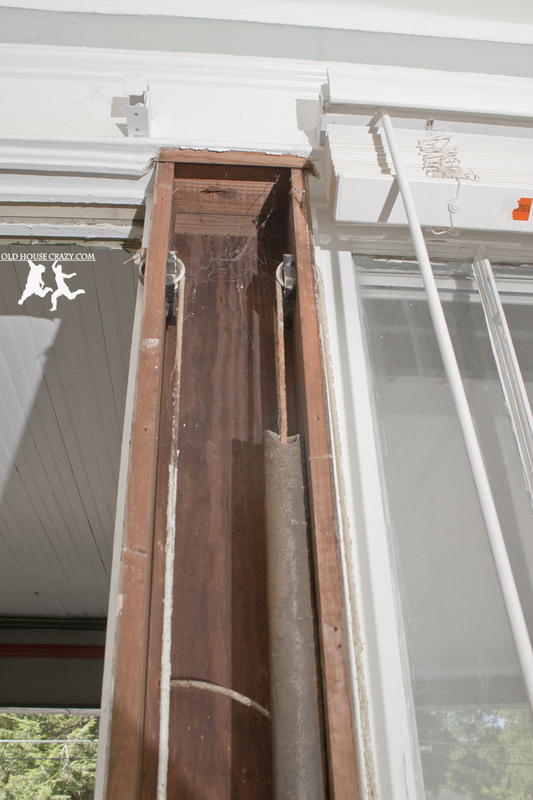 Remove the moulding that holds in the bottom sash using a small pry bar. After that experience with emergency glass replacement, I started to feel like I could actually figure some of this home maintenance stuff out on my own. I see these windows as the beginning of my life as an old house crazy nutjob. 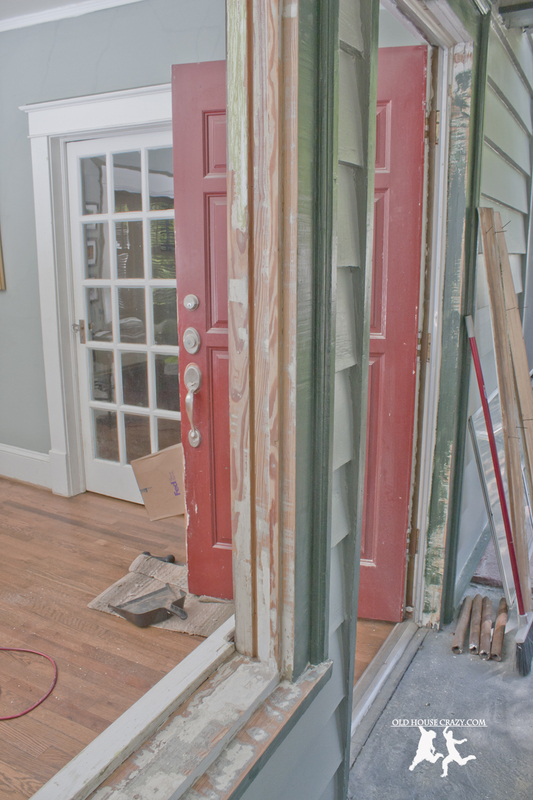 The rest of this post will detail how I disassembled these old windows and got them ready to work properly again. The bottom sash is removed. Check out the layers of white paint above where the bottom sash used to be. The first step was to remove the storm shutters so that I’d have access to both sides of the windows. This is important because both sides are painted shut. You’ve got to break that seal on both sides or you won’t be able to open the windows, no matter have many days per week you go to CrossFit. 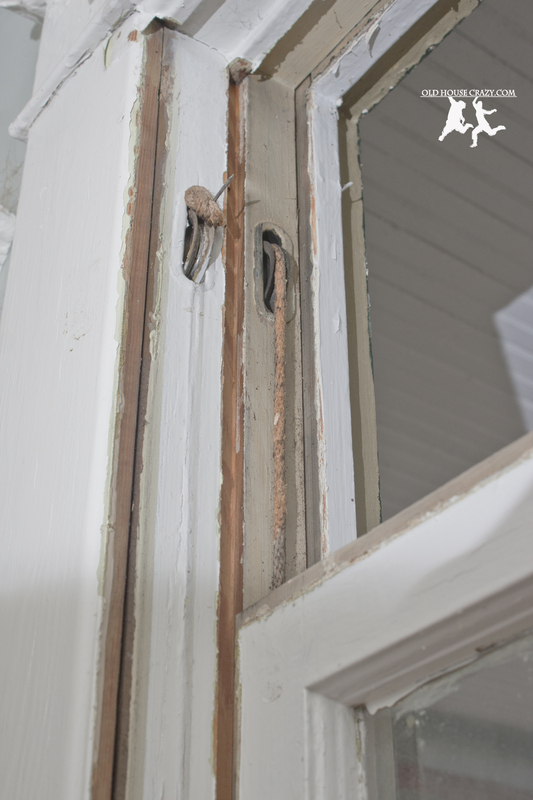 In order to remove the upper sash, you’ve got to remove the thin strip of wood that’s holding it in place. Look at the paint buildup. It takes a lot of work to get things moving again. Once you’ve got access to both window sashes, inside and out, use a razor blade or sharp knife to cut between the sashes and the window box. You’ve got to break that seal. The next thing is to remove the trim that holds the bottom sash in place. 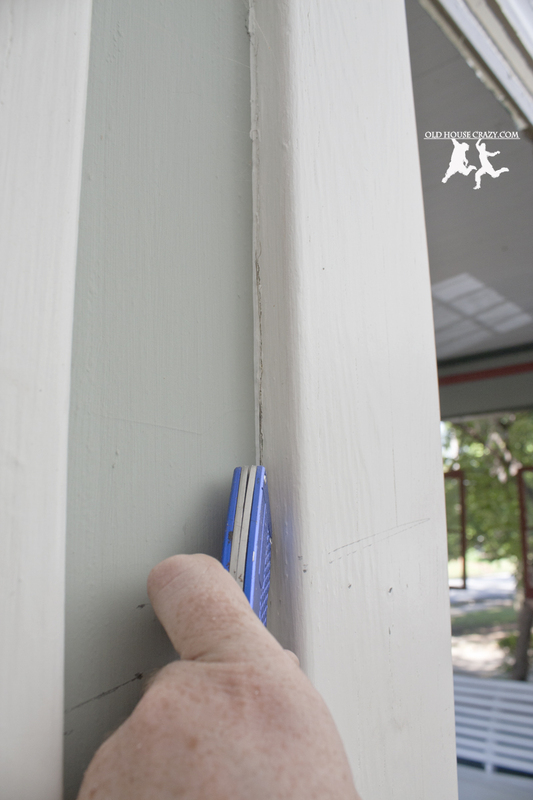 Use a small pry bar and a rubber mallet to pry off the trim. Be careful not to break it. 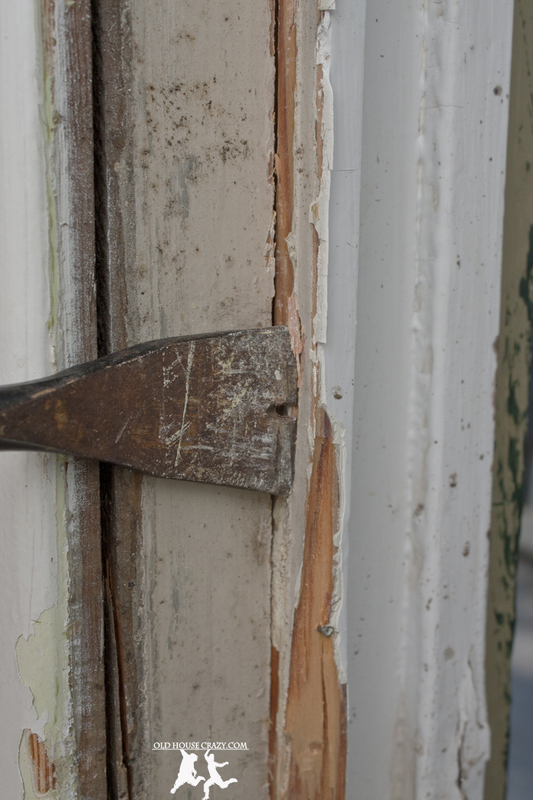 There’s a pretty good chance you won’t be able to find replacement trim that matches perfectly. I use a pry bar and a rubber mallet to remove the thin strip between the sashes. Getting the bottom sash out was easy. Getting the top sash out is much more obscenity-inducing. The trouble is that little piece of wood that separates the two sashes. It fits very snuggly into a groove and should NOT be nailed into place. As you see in the photo above, some clown nailed mine in place so I’ve broken two of the last three I’ve tried to remove. It’s also tricky because of the way the upper sash uses this piece of wood like a track. You can see in one of the photos above that the upper sash actually protrudes just past the edge of this piece of wood, keeping you from pulling it straight out of the groove. You’ve got to twist it while you pull, which is really tricky when it’s also attached to the adjacent boards with many layers of paint, and some stupid nails. Once the upper sash is moving again, you can see both sets of pulleys. 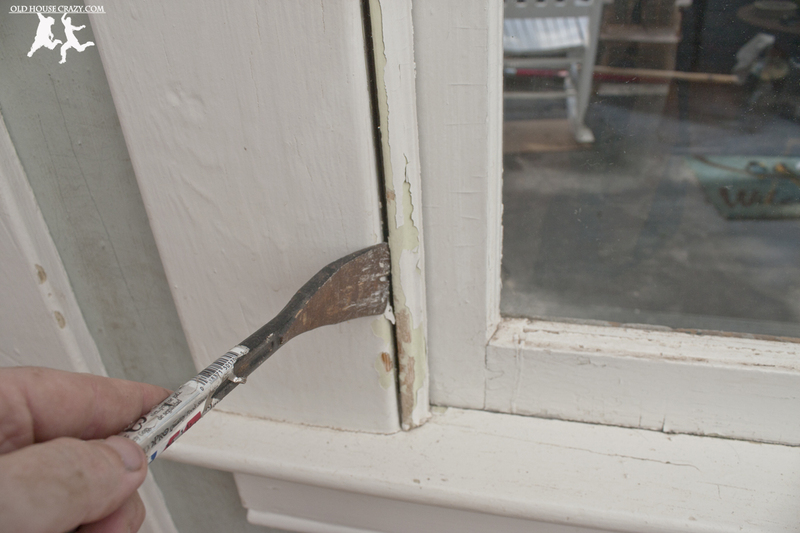 Once you’ve removed the little piece of wood from the groove, the upper sash is free to come out of the window box, assuming you’ve also cut the paint all the way around AND there aren’t too many layers of paint below it in its tracks to allow for motion. I actually had to chip away some of the paint directly below this sash to allow it to slide downwards. You can see the layers of paint blocking the tracks in the photo below. You’ll need to scrape all of that off it you want the windows to function properly. All that paint makes it really hard to open or close windows, even if they aren’t painted shut. In order to get at the weights and restore the pulleys, you’ve got to remove the large boards which make up the outside of the window box. I’ve learned to cut the paint between these boards and the wall. Otherwise, you can remove large chunks of plaster along with the board. Slice through the paint around the edges of the face board so that you don’t rip apart your plaster when you remove the board. Use a pry bar to lift up the panel and you’ll have access to the weight pocket hidden between the windows. The photo below shows the pocket between two windows: four pulleys, two for the bottom sashes, two for the top sashes. Here’s what’s hiding behind that face board. The weights are much heavier than you might think. Once everything was taken apart, I did my best to scrape all of the old paint off of the tracks and the rest of the window box. Wear a mask and some gloves. 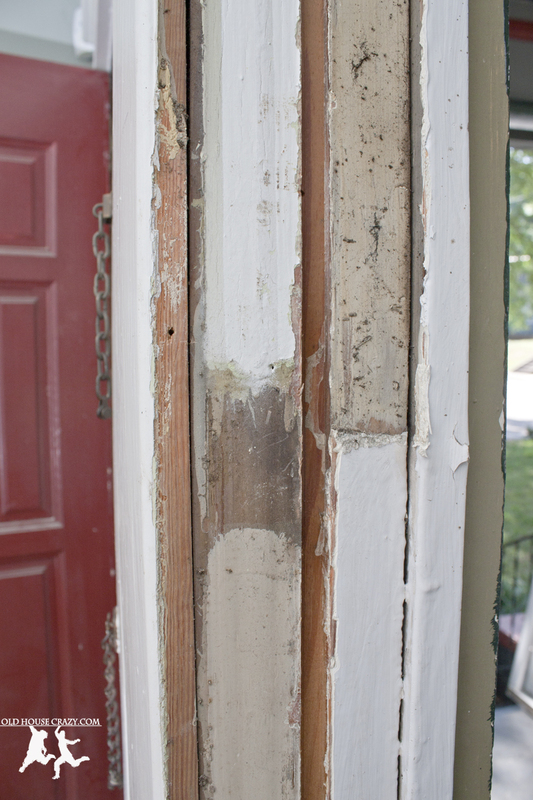 Remove as much of the old paint as possible from the sash channels. I scraped almost all of the paint out of the sash channels so that they can slide more smoothly. This next photo shows how the window sashes are actually connected to the weights that are hidden in the walls. The rope ties to the weight, wraps around the pulley, hides in a groove on the side of the window sash, and is secured in a little pocket. When replacing the ropes, I just tie a knot. Some jerks drove nails through my ropes so they were really difficult to remove. The ropes fit into grooves in the side of the window sashes. It’s very smartly designed. 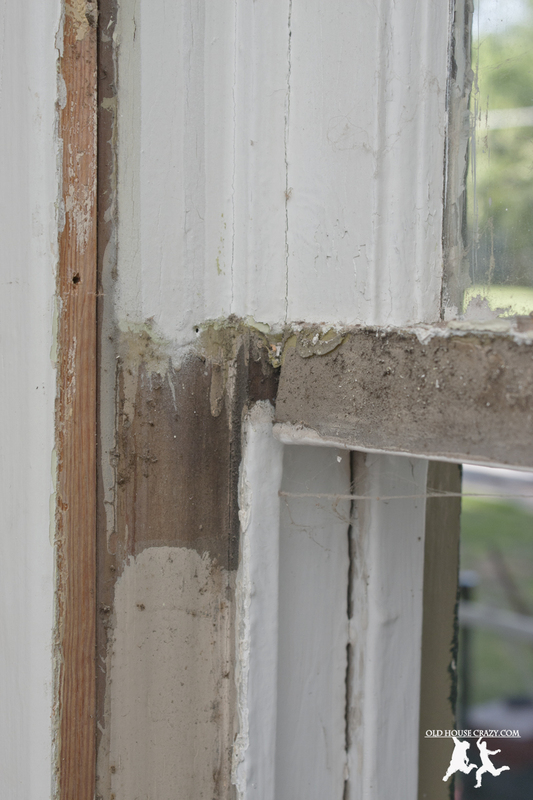 In one of my next posts, I’m going to go into detail about replacing glass panes and reglazing the windows. 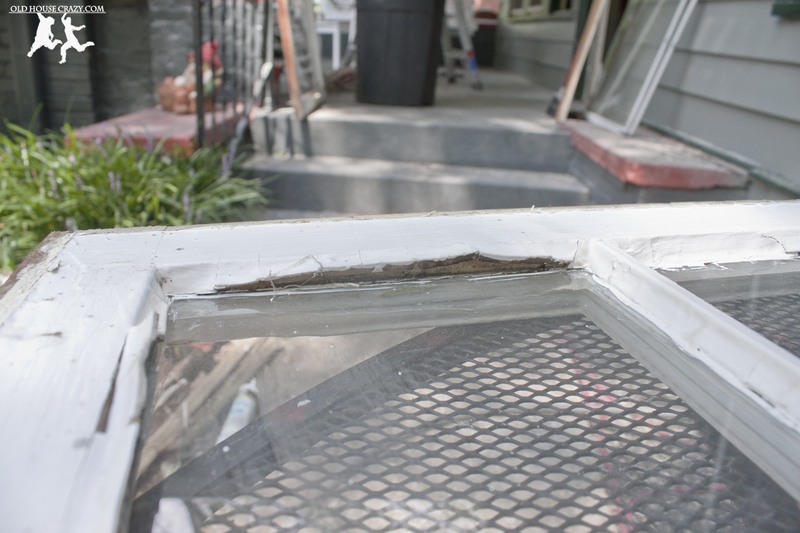 In the photo below, you can see the glazing compound pulling away from the glass. The purpose of glazing compound is to weatherproof your windows, so it is inaffective if it isn’t sealed onto the glass. It needs replacing every 50 years or so if it’s done properly. I’ll post the second part of this project in the near future, detailing how I put the windows back together. I’m also planning a post on replacing glass and glazing the sashes, as that can be useful no matter what kind of windows you’ve got. This entry was posted in Better than store bought, DIY, Don't Hire a Professional, House Repairs, Old Hardware, Painting, Restoration, Windows and tagged DIY, diy project, don't hire a professional, house maintenance, painting, pulley windows, restoration, weight and pulley, windows. Bookmark the permalink. I’m not sure we even had the frames for most of our windows when we got this house. I like that you are repairing instead of replacing your windows. Enjoyed your post. Interesting to see how these windows are designed. Very interesting. I am excited to get to that part of my restoration. Thanks for the insight! You’re welcome. Thanks for reading and good luck. 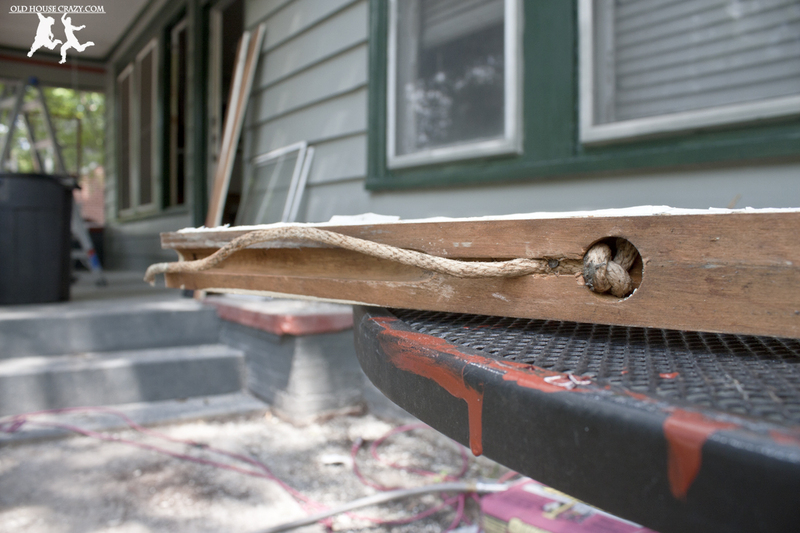 The “jerks” who drove nails through your sash-pulley ropes was the guy who originally installed the windows. That’s how they did them way back then. It was just added assurance that the sash cords wouldn’t come loose. Just saying. Thanks for the insight, Ed. I figured out was something like that. I guess it’s kind of hard to walk the line between making sure your work lasts and making it easy to repair down the road. I can say that the nails in the rope and in the parting bead are quite common. They often were put in originally. Great explanation on how to do this. Thanks! I saw Nicole Curtis do replace the rope and pulleys on and HGVT show, but I love written instructions. I live in a 100+n year old house and really need to fix all of my windows.